Ginger cakes Best in Winter No. 4. 1/2 lb sugar 1/2 lb. butter 1 & 1/2 pints molasses 1 teaspoon soda ginger to taste flour to make it stiff knead a great deal. Soft Gingerbread. Mrs. Condit. No. 3. 1 cup butter 1 cup sugar 2 cups molasses 6 cups flour 3 eggs 1 teaspoon soda, spice to your taste. Hard Gingerbread. Best in cold weather No.4. 1 cup butter 1 cup lard 1 cup water 1 cup sugar 2 cups molasses 1 teaspoon soda - spice to your taste flour to be stiff enough to roll out. Soft Gingerbread Mrs. Marsh. No. 5. 6 tablespoons warm water 1 cup molasses piece of butter size of hens egg 1 teaspoon soda little ginger. Ginger snaps. No.5. 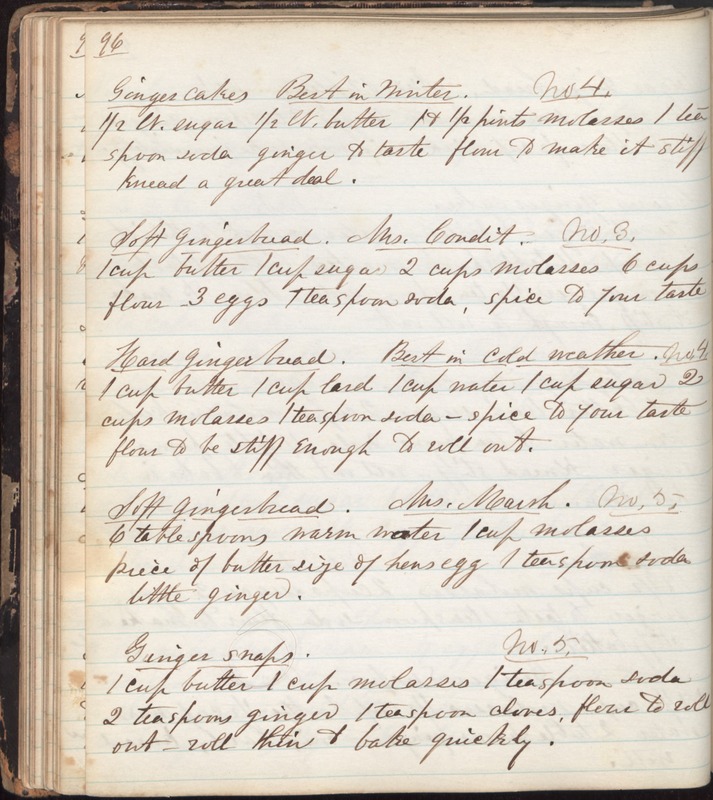 1 cup butter 1 cup molasses 1 teaspoon soda 2 teaspoons ginger 1 teaspoon cloves, flour to roll out - roll thin & bake quickly.